Current research involves application of silicone nanotechnology for pre-sealing pressed concrete blocks and pavers using a silicone-based water repellent admixture. The treated concrete exhibits low water permeation and high efflorescence resistance. 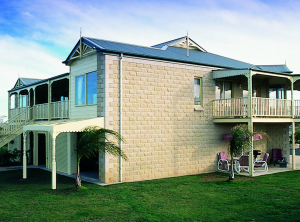 Pressed concrete masonry such as blocks, pavers and roof tiles have been widely accepted in the building industry. Due to the permeable and hydrophilic nature of concrete, water becomes an important factor affecting the performance and the durability of the concrete 1, 2, 3. Permeability of concrete also leads to efflorescence which becomes a problem for decorative concrete. Efflorescence is caused by moisture moving through the capillaries. The moisture carries the calcium hydroxide produced from cement hydration to the surface. The carbonation of the calcium hydroxide on the surface results in insoluble white calcium salt streaks which are detrimental to the appearance of the concrete 4. Water repellent admixtures can minimise water movement within the concrete and hence reduce water absorption and efflorescence of the concrete. Conventional oil-based water repellent admixtures such as stearates and oleates have been used in pressed concrete for many years 5. The performance of these admixtures is not satisfactory due to the fact that they are not permanently bonded to the substrates. The water repellency is due to the hydrophobic deposit of calcium stearate or oleate within the concrete. These admixtures are subject to breakdown due to weathering and biological deterioration. Research has shown that an admixture involving the application of silicone nanotechnology using a silicone-based water repellent admixture can achieve excellent results. The nano-molecular polysiloxane lines the capillary walls of the concrete via strong siloxane linkages converting the hydrophilic nature of the concrete into an hydrophobic substrate 6, 7, 8. The silicone admixture overcomes the limitations inherent in traditional non-reactive admixtures. Figure 1 show the molecular structures of both conventional and silicone admixtures. Unless otherwise stated, the test concrete used this research was prepared using GP cement and clean sand at ratio of 1:4. The water addition rate was controlled to obtain a consistent semi-dry concrete mix (not a wet slurry). The admixture was first dispersed into the water and then mixed into the dry concrete mix. The semi-dry concrete mixture was then pressed into a plastic mould and removed immediately to obtain the test disk of size of 30mm high x 70mm diameter as shown in Figure 2. The curing conditions involved at least 24 hours covered in a plastic container and a further 7 days curing to an approximate constant weight at ambient conditions. The silicone water repellent admixture named Emulsion KR2 is a water-based emulsion containing active silicones. As shown in Figure 1 these silicones react with concrete ingredients via strong siloxane linkage and form a polysiloxane nano-molecular lining in the capillary wall of the concrete. This polysiloxane effectively imparts water repellency to the concrete 6, 7, 8. 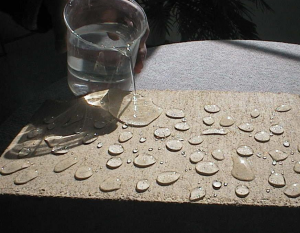 The water repellent effect is shown in pressed concrete containing 0.05% KR2 (Figure 3). Capillary water absorption was conducted in the laboratory using a test disk according to DIN 52617 as shown in Figure 2. The water absorption after 24 hours is presented in Figure 4. The result clearly showed that the capillary water absorption of the concrete containing Emulsion KR2 was significantly reduced. The results also indicated that addition of 0.05% of KR2 into the concrete was sufficient to make water resistance concrete. The resistance to rising damp was conducted by placing a commercial concrete block in a water bath. The treated block and the control were placed in water for 24 hours, removed and broken in half as shown in Figure 5. Results showed that block containing 0.05% Emulsion KR2 was dry inside while the control was fully saturated with water. The results indicated that the treated block provided enough resistance to rising damp. The resistance to wind-driven rain or water penetration under pressure was conducted by Australian Commonwealth Scientific and Industrial Research Organisation (CSIRO) according to ASTM E514-90. 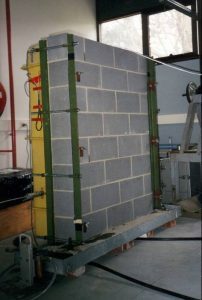 This test was equivalent to a wind-driven rain of a wind speed of 120km/h (or 500pa) against a single skin block wall build with commercial concrete blocks containing 0.05% Emulsion KR2 as shown in Figure 6. A water repellent admixture was also added into the mortar to form a complete water-resistant wall system. The results showed that the test wall successfully passed the 4 day test period which was far superior to the ASTM standard of 4 hours. 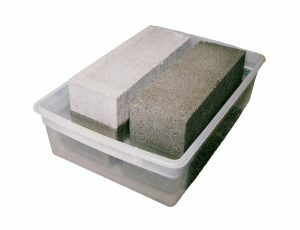 The standard concrete block wall without Emulsion KR2 generally resists significant water penetration for only 20 minutes under the same test conditions. The accelerated efflorescence test was carried out by laying the concrete disk onto a tray containing 10% sodium sulphate solution at a depth of 10 mm for 7 days. The top surface of the disk above the solution was visually examined for the evidence of efflorescence. The test results indicated that the concrete with 0.05% or more Emulsion KR2 showed almost no evidence of efflorescence after 7 days of the test period (Table 1). The efflorescence of the concrete with 0.025% Emulsion KR2 was significantly delayed compared to that of the control. 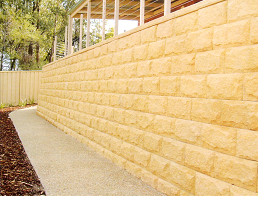 The natural efflorescence test was conducted by TASCO – a concrete block manufacturer from Tasmania, Australia. 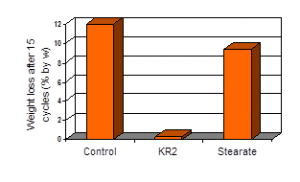 The results indicated that the commercial concrete blocks containing 0.05% Emulsion KR2 showed remarkable resistance to the efflorescence against 10 years natural weathering (Figure 7). Durability of the concrete was investigated by an accelerated salt crystallisation test using the test disk by repeatedly dipping the concrete in 10% sodium sulphate solution for 8 hours and drying at 70°C for 16 hours. Repeated ingress of salty water into the concrete and drying can result in serious damage to the concrete due to the repeated salt crystallisation in the concrete capillaries. In this test, both untreated concrete and concrete with a conventional stearate-based water repellent admixture were used as the controls. 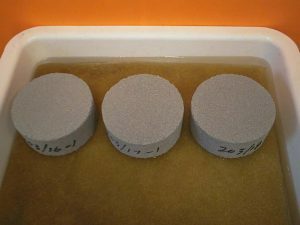 The test demonstrated that after 15 cycles of dipping and drying, the disk with Emulsion KR2 remained almost unchanged while the untreated started eroding after 5 cycles. The sample with the stearate showed some resistance to erosion in the early cycles but the erosion then accelerated. 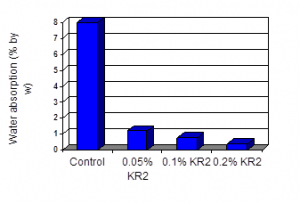 This proved that the durability of the concrete with KR2 was superior to those with traditional oil-based admixtures. The sample with KR2 was almost unchanged and still showed a good water repellent effect after the test. Figure 8 shows the concrete disks before and after 15 cycles. Figure 9 shows the weight loss of the test disks after 15 cycles. This silicone water repellent admixture has been used by all major Australian block and paver manufacturers including Boral, C&M and Hanson for the past 10 years. The concrete blocks and pavers containing this admixture are highly recommended by architects in Australia. The new admixture is particularly useful for coloured or decorative concrete and for applications where water-resistant construction is required. A residential house built with concrete blocks manufactured with the silicone admixture retained its original beauty after many years (Figure 10). 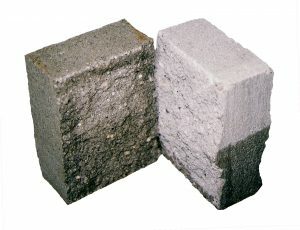 Retaining walls built with split face concrete blocks containing the new admixture showed a clean finish for years (Figure 11). 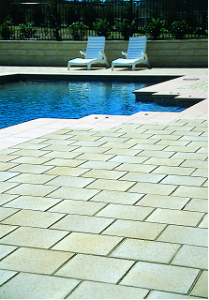 Pavers containing the silicone admixture around a salt water swimming pool remained its original appearance in a salty water environment for many years (Figure 12). Figure 10. A house built with concrete blocks containing KR2 admixture. Figure 11. A retaining wall built with concrete blocks containing KR2 admixture. Addition of the silicone water repellent admixture into pressed concrete imparts significant water repellency. Efflorescence of the concrete was effectively controlled. Thanks to the permanent polysiloxane nanomolecular lining within the concrete, the addition of the silicone admixture significantly improved the durability of the pressed concrete. The successful application of the silicone admixture in Australia for the past 10 years has proved the remarkable value of this new technology to the concrete block and paver industries. 7. Silfwerbrand, John, “Hydrophobe IV Water Repellent Treatment of Building Materials”, Aedificatio publishers, 2005. 8. Kaesler, Karl-Heinz, “Water-basted siloxane emulsion as Water Repellents for Masonry and concrete”, Chapter 11, Coatings for Masonry and Concrete, Brussels, Belgium, June 30-July, 2003.